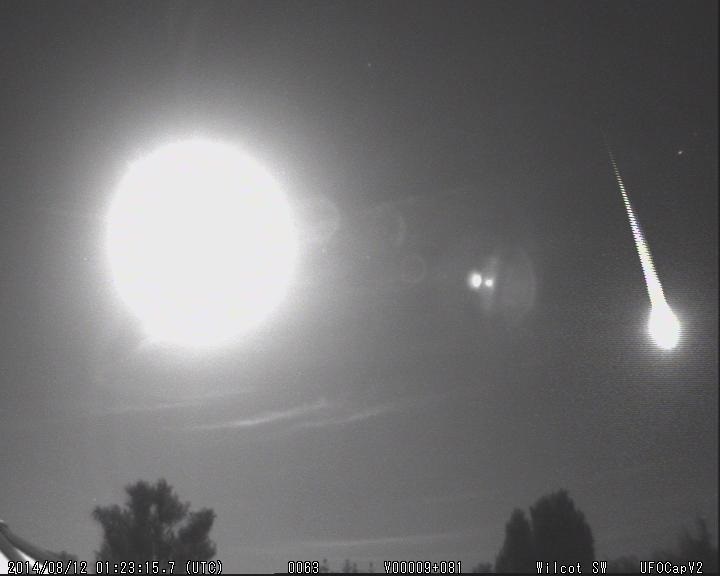 A fireball is simply an especially bright meteor. By internationally agreed definition, any meteor that attains magnitude -3 or more is classed as a fireball. When a fireball has been seen from more than one location, it is possible to combine the individual reports and work out the trajectory the the fireball followed through the Earth’s atmosphere and also its former solar system orbit. However, for this to be possible, we need witnesses to send in reports of what they saw. The SPA Meteor Section collects and analyses data on fireballs seen primarily from the British Isles. However, with the main SPA Fireball Report form now being linked to an international database, reports submitted via the form for fireballs seen in other countries will be recorded in the database against the country involved. The SPA offers a choice of fireball report forms, allowing for the fact that some witnesses may be more familiar with the night sky than will others. In the meteor literature, you may come across these two terms. They both refer to very brilliant fireballs. Bolide, from the Greek bolis, “missile” or “thrown spear”, is a term not properly defined anywhere. Some authorities say it can be used for any bright meteor interchangeably with “fireball”, others that the defining brightness is magnitude -9, still others that the meteor must be very bright and produce sounds (either acoustic or electrophonic). As a term in meteor astronomy, it is usually applied to bright, spectacular fireballs, with little regard for the specifics of the event. A superbolide is a fireball-class meteor bright enough to be detectable from space by US Department of Defense, or similar, satellite sensors. Its defining minimum brightness is about magnitude -17. These are incredibly rare, but are visible even in broad daylight when they do appear. There is also a very good chance meteorites will result from such an event. Not all very bright objects seen moving across the sky are fireballs. Three of the commoner objects mistaken for fireballs are aircraft lights, satellite flares and “sky-lanterns”. Notes on how to help recognise them are given below. Aircraft lights: Ordinarily, aircraft headlamps, searchlights, landing or cabin lights are not likely to be mistaken for anything else, but sometimes these can be less obvious. Repeat flashes from landing lights in a similar area of sky soon afterwards mean the object was not meteoric. Afterburners on a distant jet aircraft, where no sound from the vehicle was heard, can look like a point-source, or short-pathed, meteor or fireball, if in just the right orientation, and can sometimes seem to move across the sky leaving a trail or streak from the exhaust gases. In all cases, the movement is liable to be slower than most natural meteors, but the best way to tell what was seen is to check the object with good, firmly-held binoculars, as these should enable other tell-tale details to be spotted. If the object streaks across the sky and is gone before you can swing your binoculars into action, it may well have been a meteor after all! Aircraft contrails: For most of the time, there is little risk of mistaking these for meteors. However, when the Sun is close to the horizon and illuminating them from below, observers sometimes mistake contrails for fireballs or their glowing persistant trains. Their locations low in the east near sunrise or low in the west near sunset are good reasons to be cautious. The long reported durations, often in excess of a minute are a further clue. One particularly famous example, which fooled NASA for a while, occurred in 2003 and was related to Concorde – for more info, see original report and image and concorde explanation . Satellite flares: While the Sun is not far below the horizon, artificial satellites orbiting high above the Earth may be seen due to reflected sunlight. In winter, this situation occurs only for a few hours after sunset or before sunrise, but during the British summer when twilight never ceases, satellites can be seen throughout the night. Many of these are quite faint and continue to track over the sky for several minutes, so are quite unlike natural meteors, and could not be mistaken for them. However, there are also many Iridium communication satellites orbiting the Earth, and some others, which have solar panels that can reflect the Sun brilliantly, creating the impression of a dramatic, almost meteoric, flare. These have been recorded as reaching quarter-Moon brilliance, before fading to about magnitude +2 to +3, or disappearing entirely. Although as with all man-made objects orbiting the Earth, their apparent speeds are far below those of even the slowest natural meteors, the short-lived nature of their flares can sometimes make them much more difficult to tell apart from a genuine fireball’s flare. If you are not sure whether what you saw was a satellite flare or a fireball, make an immediate record of what you saw as usual, taking particular care to note the exact time, and the flare’s altitude and azimuth. Then as soon as possible, check the Heavens Above website to see whether any of the events listed there coincided with the event you observed. The Heavens Above site can also provide predictions for Iridium flares for any given location, which information can be used to make a few observations of these flare events to familiarise yourself with their appearance. This experience should make it easier to separate them from possible meteor flares in future. Sky-lanterns: Sky-lanterns: These are small, roughly metre-high, paper hot air balloons, each powered by a burning wick suspended below it. 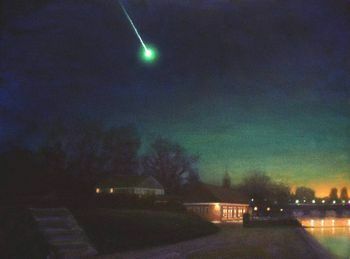 Released singly or sometimes in groups to “celebrate” some event, and moving with the wind, they first started to appear as objects mistaken for meteoric fireballs in the summer of 2007 over Britain, and have recurred with increasing frequency ever since. They might occur at any time, but there has been a clear tendency for sighting numbers to rise significantly during holiday periods (notably in July to September, around October 31 to November 5, and from mid December to early January). They can look like literal “balls of fire”, but typically are much slower-moving than meteors (natural meteors rarely last more than a few seconds, but lanterns can remain in-sight for several minutes). Colours commonly reported are yellow, orange or red. However, coloured or patterned balloon-bags may lead to other shades being seen too, including black, the latter either because of shadow effects, or printing on the balloon. Genuine fireballs never show black, only brilliant, radiant light. Sometimes the objects are clearly burning or flickering, occasionally dropping flaming or glowing material vertically below them, and they can also seem surprisingly bright for their size, because effectively, what is seen is something approximating to a rounded, metre-high candle flame, due to the illuminated balloon-bag. There have been sightings of a short, dark, smoky “tail” from some lanterns, not always along the object’s line of motion (a meteor may also show a tail, but at night this will be generally bright, and have a streak-like appearance along the meteor’s path). The fact lanterns can appear in groups has also led to numerous “UFO” or “mystery lights in the sky” press stories. In theory, lantern mass-releases are supposed to be notified to the UK aviation authorities in advance, but it is clear this does not always happen, nor is it obvious just how many sky-lanterns constitute a “mass-release”. Worryingly, there have been growing numbers of emergency service alerts, especially to lifeboats, because of red or orange lanterns being mistaken for distress flares. To tell lanterns apart from meteoric fireballs or other astronomical targets like artificial satellites, again the best way is to examine them with good binoculars. This should enable an easy confirmation of what they were. Very few genuine meteors will remain visible for long enough to let you get binoculars into action and properly focused! More information about sky-lanterns and the confusion their appearance may cause has featured in the SPA’s Electronic News Bulletins, ENBS, and on the Forums, several times. See for instance the notes and links in ENB 270. In all cases, if you are not sure whether you saw a genuinely meteoric fireball or not, please submit as full a description as possible of what you saw, from where and when. A fireball sighting should be reported as soon as possible after the event. This is very important as you can easily forget some details if you delay. Where you were. The good news is that the interactive report form in the link below can identify precise locations from post codes, parts of post codes or village/town names. (If using the second (detailed) report form, give the name of the nearest town or village and the county if in the British Isles. If elsewhere in the world, give your geographic latitude and longitude, as well as the place and country name). The date and time of the event. Good news is that the interactive report form should automatically know whether BST or GMT is currently active in the UK. (If using the detailed form, please state clearly whether this is in Greenwich Mean Time (GMT, same as UT), British Summer Time (BST) or in a different time zone). Where the fireball started and ended in the sky as accurately as possible or, if you did not see the whole flight, the first and last points you could see of the trail. The interactive form helps you by displaying a map of your local area on which you can mark the start and end directions. Most witnesses of fireballs will not be familiar with the stars and constellations of the night sky. If you do happen to be familiar with the night sky, there is the option of also completing a second more detailed report form. Notes on the more interesting or better-seen fireballs feature regularly in the ENBs and sometimes on the SPA Forums, while the Recent Fireball Sightings webpage has a regularly-updated list of fireball reports seen from the British Isles and nearby.